Since sharing that we’re expecting #8, I’ve been kind of blown away by the outpouring of love and support in response to the announcement. I know that many of you have followed along here for ages and probably feel as if you know our family personally (I feel the same about certain online “friends”), and I expected you to be kind (and you were!). But I also know that 8 (!!) sounds a wee bit batty to lots of folks (20-year-old Abbie would have thought so, certainly). So, I expected at least a few bemused responses and maybe even a few downright hostile ones (I’ve received it and seen it elsewhere before). And yet, the reaction has been universally positive–effusively so, even. I say all of this both to thank you for your kindness but also to establish that I know exactly what it feels like to press publish on a post (blog or otherwise) with trepidation in my heart and a tremble in my fingers. It is hard to expose such a tender part of your heart to the world, only to have it handled roughly by strangers. Imagine then, how much harder it would be to receive unwelcome responses from someone close to you. (Some of you don’t have to imagine because you’ve already experienced it). Not a stranger, but someone who knows you well and still chooses to receive your news of joy with a sneer or a smirk. A sweet reader recently messaged me asking how to cope with that fear of what others will think when they reveal the news of “yet another kid.” Had I ever dealt with that? What did I do? Answer: Yes! The thought of what others would think has (sadly) been among the first that have popped into my head every single time I’ve seen a positive pregnancy test result. To be fair, that worry has lessened each time because 1) hey, if they haven’t figured out that this is how we roll by this point, nothing I say is going to change their response, and 2) the older I get, the less I twist myself into knots over whether people like my decisions as long as both my husband and I know them to be godly ones. Truth is: it doesn’t take a whole lot of negativity for the doubt to creep in. One woman in particular comes to mind each time I’m pregnant, and I inwardly groan, dreading Mary’s (not her name) finding out and making another comment about how I “already have quite the litter.” (Yup. Litter). My family? Completely positive. Shaun’s family? Same. And I KNOW what a blessing and how unusual that is (from so many of you writing to ask how to deal with resistant family members). But here’s the thing: maybe you’re not announcing Baby #5 or #9. Maybe it’s your first and you’re getting blow back because of the timing (I can still remember the lady who chirped: “Oops! Accidents happen!” upon finding out that we were pregnant with our first only 3 months after our wedding…who was not an accident, by the way). Maybe it’s your second, and they’re close together, and your Aunt Mildred says something like: “Didn’t we just do this?” (We, Aunt Mildred? We? I don’t recall your taking a turn when I was pushing this baby out). Maybe it’s Number 3, and the first two are boys, and you’re maybe sorta hoping for a girl but happy with whatever God gives and yet dreading the exclamations of condolence if it turns out to be “yet another” boy. The thing is, negative responses to kid numbers (of any size) don’t just stop at pregnancy announcements, as I’m sure you’ve noticed. A teenager at the gym daycare the other day exclaimed, “Oh, I’m SORRY!” when I revealed that I actually had 7 kids on the outside and one baking (Honor and Theo were the only ones with me). (My response: “Don’t be! I’m not!” With a big smile, of course). So, given the fact that we are guaranteed to encounter some kind of negativity to the number of kids we have (whether 0 or 20), how do we respond? Well, first, let’s go with how we don’t respond. I wasn’t afraid of any such thing, y’all. I’d just allowed a few condescending remarks to undermine my confidence and felt hesitant to own my excitement at adding a sixth baby to our crew. Do you know how they would have responded? With cheers! Because the tone I had set would have determined theirs. When we are ready to tell the world about the children (regardless of the number) that the Lord has gifted us with, we should boldly proclaim our excitement, joy, and anticipation of the amazing things he is going to do with us and through us and this new life. Being pregnant inside marriage is nothing to be ashamed of. It is a part of God’s plan for humankind (although, I know many who are still struggling to find their place in that plan and hope that you can read this with as little pain as possible). And it is a GOOD plan. Every single baby is a good, good gift. And I have found that each time I put the focus on that truth and conveying that joy to the rest of the world, the world tends to join with me in rejoicing. (Not always the case, I realize, but often true). So, here’s my encouragement to you: if you feel led to have lots of babies, have the babies the Lord gives you and announce their imminent arrival with ecstatic confidence. Same answer if you’ve been called to a smaller number. EVERY. BABY. IS. A. BLESSING. Side note: Several years ago, after a kind lady told me what an encouragement my positive response to her compliment on my “beautiful family” had been, I started making it a practice to respond super positively to as many comments (good, bad, neutral) as I can about my children. I say things like: “Yes! They are fun” and, “I really like them!” It throws people way off. Because when they say something like, “I don’t know how you do it with 7. I’m losing my mind with 2,” they are expecting a similarly frazzled response. Thing is: you may be feeling frazzled in that very moment. Kids are expert frazzlers. But just by choosing to focus on the positive (“It can be a bit chaotic, but I wouldn’t trade it for anything!”), your perspective shifts, and you are able to see your kids for the blessings they are. AND! You have given that other frazzled mom something unexpected to chew on, instead of the usual elbow nudge of negative solidarity. Who knows? It may help her to view her kids in a different light or just lift her spirits a bit. Choosing joy when we’re dreading others’ not joining in is hard. But hard is not the same thing as bad, and the more joy we choose, the more permission we give for others to do the same. Speaking of pregnancy announcements, where my other pregnant mamas at? I’d love to know your names, due dates, etc. so I can pray for you and rejoice with you (just like you’ve already done for me). I found this post on accident today and I’m so grateful for your words! We are pregnant with number five and it’s a big surprise for us. Our oldest is 14 and youngest is 8 so we are preparing ourselves for the onslaught of comments and jokes. We know God has a purpose for this baby and are excited but also a bit nervous to announce. Than you for your encouraging words! So encouraging to hear Abbie! I’m about to announce Baby number 7… I have 6 girls…. so I can resonate with a bit of everything you just wrote about. I have only one question for y’all. Dont you worry about overpopulating the globe? The effects on your children and their children? Thanks. I stumbled upon your website today and am so glad I did! My husband and I have 5 beautiful boys, and we are expecting our 6th boy at the end of Dec/beginning of January. I dreaded telling others about our 6th pregnancy, because there are always those people who have to be rude…and why is it that their comments stand out more than the kind and loving ones?! Anywho, thank you for writing this and for letting us other mommas get stuff off our chests, too! Thank you for this post – it was a great encouragement in how to respond when I get (many) comments on handling 3 going on 4 (this/next month) and so on….the thing is, I am really struggling at the moment and usually feel like I would be lying if I gave a really positive response, but I never give a negative response either. I just feel like I have to let them know that I’m not a superhero. I’m trying to figure out how to do that without sounding like I have it all together, but be positive about my kids and how they are a gift AND not come off excessively churchy. But I’m especially inspired to joyfully, unapologetically announce if we are given another baby after this one, and not fear my Grandma’s response or any acquaintances thoughts. Thankfully our immediate families have always been positive and I know always will be! Congratulations again on your precious baby 8!! I am expecting #3 in October, and many people have asked if this baby is a surprise since the gap will be almost 5 years and I already have a boy and a girl. I’m a lawyer working full-time, so having 3 kids is really outside the norm. It’s refreshing to know there are lots of big families out there, that 3 kids doesn’t make my family such an outlier. Congrats on #8. Abby, thank you for this beautifully written post! I just gave birth to my #5, Collette, 10 days ago (oldest is 7, so they are all less than 2 years apart, aside from 2 of them). She is also our 4th girl! I get so many comments that steal my joy, and I love the idea of turning it positive. I agree that every baby, no matter how many we are blessed with, is a gift from God! My father brought me an article the other day written by a man expecting his fifth child, and the biggest takeaway was that every child has brought something to their family. I feel that exact way about my children, each one has brought so many special gifts to our family! Thank you again for your honesty and grace! Pregnant with twins and due in late March (prayerfully)! We have a 4.5 yr old and miscarried at 9 weeks back in March of this year. We prayed fervently to conceive again and for just “one more chance” to see a healthy heartbeat and meet a baby on this side of eternity. God has answered us with two (di/di), and we are so in awe. While I’m only 8 weeks (Wednesday) we’ve seen and heard the heartbeats twice in the last two weeks and are trusting in what we cannot see to bring these babies earth-side come early Spring. Pregnancy after loss is hard, but we’re trusting. And praying. And trusting some more. Congrats on number #8!!! Oh my gosh, you guys are SO adorable! I come from a big family and I, too, have a biggish family (four kids, planning to have one more). It’s the best present I can give to my kids–my love, love for the the gospel and siblings to share the journey. Yes, Yes, Yes. Pregnant with #3. Our circumstances were much different from yours as we were not planning on having another pregnancy. In fact, I struggled (and still do) a bit with God’s timing on it. While it is my third pregnancy, it’s the fifth child that will enter our family over the course of four years- three biological and two through foster care. The arrival of this pregnancy left me so sick that I was unable to take care of my kiddos (both bio and foster). We felt that we were in a place of so much discouragement and need, and announcing the pregnancy was hard for me because I was afraid people would comment and question WHY we would do such a thing. Most people (me included, until now!) don’t understand HOW an accidental pregnancy can really come about lol! Anyways, things have gotten a bit better and the all-day morning sickness is now just at certain times during the day. I’m due the week of Thanksgiving and looking forward to being on the other side of being pregnant! Congrats to you on #8!!! We have 5 kids – the last two are 3 month old twins! Sometimes it feels like we have a billboard over our heads with blinking lights shouting “twins and extra siblings – come look!” It has been hard to have a positive response to every negative comment. Your words are so encouraging! Thank you for your post. This is timely, as I am 8 weeks pregnant with #4 (due in April) and feeling anxious about when and how to tell family because of my fear of their reaction. I’m also a little nervous as to how my oldest (8yrs) will feel about it. Thank you for your well tested thoughts on this matter. Food for thought and one more opportunity to trust God. Your article is just what I needed! I’m expecting my 4th child in March with my oldest being 3 and I’m 21 (married at 17) and we decided to leave our family size in God’s hands but with feeling exhausted and nauseous I have not been grateful enough for the beautiful children God has given me but feel as if having another is just going to add more work and struggles than I can imagine. (Which it may) but I needed to be reminded to count my blessings and be excited about #4 and know that God has a perfect plan for our family. This was a great encouragement to keep on with God honoring work. Thank you for taking the time to write it. Congratulations! Thank you for these uplifting words. I am expecting #5 January 17th and have had lots of rollercoaster emotions concerning our announcing and overall expectation of his arrival. My oldest is 6, we are homeschooling, and my husband works at home. We all get lots of each other allllllll the time It IS a blessing, but I do cover your prayers! It is also overwhelming. I LOVE this! When our family was starting out, I had three little ones in quick succession. I was lucky enough to have a dear friend who managed (without planning) to be either six months along before or after I was with her pregnancies so that we could swap maternity clothes and have ready-made best friends for our kiddoes. We happened to be living at that time in a part of the world where 1-2 child families were the norm and people were very forthcoming with their frank opinions. It seemed as if my friend and I had a fresh supply of crazy comments from strangers to laugh over every time we went out. One day, my friend said to me, “We are ambassadors of motherhood. We have to make this look good to the world, and make sure that we reflect the joy and pride we feel inwardly about our children OUTWARDLY.” I have never forgotten that. Not only has it helped me maintain my cool with tantruming toddlers in public spaces, it has helped me count my blessings during moments of discouragement. How lucky and what an honor that I get to be an ambassador! Of motherhood! Now my kids are high school and college students. And when I hear my daughters’ talking about how excited they are to be epidemiologists/authors/animators AND mothers when they grow up, it makes me glad that they were able to see for themselves how happy I’ve been being their mom. When I found out I was pregnant with #4, I still remember the embarrassment and almost shame I had telling others about the pregnancy. Three kids is one thing, but what kind of crazy person purposefully has more than that! I didn’t really think that, but I assumed everyone else did. After having #5, my outlook changed. I will never apologize or act embarrassed about the fact God graciously gave a new life to our family. What other amazing gift and honor do we receive with embarrassment or worry about what others will think? I don’t know if we’ll be blessed with more children but I know for sure, I will never explain, make excuses for or apologize for my children being born ever again. First, congratulations!!!! I’m expecting my first baby Sept 21st and we could not be more thrilled. We struggled with infertility for over a year and was told to consider a surrogate last October because it was “scientifically impossible” for me to get and stay pregnant and then miracle of miracles I became pregnant naturally at the end of December! So so thankful. I absolutely love the sentence “You have given that other frazzled mom something unexpected to chew on, instead of the usual elbow nudge of negative solidarity”. I feel like this crosses over to so many other aspects of life too. It’s easier to go the route of “negative solidarity” than respond with a positive that could shift the perspective. Keeping this in my back pocket!!!! I always enjoy reading your thoughts and perspectives! I just love this. And your perspective on just about everything in life is so … challenging for me, in the best, most uncomfortable way. If only we could be friends in real life! Until then, I’ll continue ‘amen-ing’ and ‘oh. that stings real good’ from another tiny East Texas town, while discussing your approaches to parenting and chores and marriage with my girlfriends over coffee. And, in true God-fashion, my many boastings of being ‘done having kids’ turned into an ‘oops’! Baby #3 is due in September. Reactions have been funny, with the exception of my mom who has no poker face nor filter. But whatever. I think we are excited? But I’m with you – pregnancy is not my jam, so that’s been challenging. gr88888888 posting. If anything, this news again spurs a bit of envy on this old lady’s part. you and your hsb are beautiful people and what gorgeous children you have. I just love your outlook and appreciate it so much that you share your thoughts and beliefs on these topics. We also believe that it’s God decision as to how many children He decides to bless us with, not ours. I’m due with my husband’s and my first baby in four days (August 27th). While we have gotten almost all positive responses from our announcement, the decision to not find out gender until the birth has come with varying opinions. Most people greet the idea with joy but there have also been several comments about how “they could never do that so they don’t understand how we could possibly wait to find out” or how we “must have a wish that the baby is one gender over the other” (we don’t). I respond with a positive comment and move on because in the end it’s our choice and we’ve loved not finding out but I know it isn’t for everyone and I respect that, too. Love this choose joy message today for me. Thank you! Another reason I like to be upbeat about our large family when the inevitable cashier’s remark or whomever comes at us, is to see the look on my children’s faces when I say how wonderful they are. Or how much we love having ALL our children or my personal favorite when I’m pregnant again, (Clearly, we love these kids and they’re great. That’s why we have so many of them;) Congrats on your amazing news! Prayers for an easy pregnancy/delivery. Congrats! What a blessing! We just had our fifth this past winter and we get comments all the time. From family, friends and strangers. My favorite are the questions “Are you done? !” And “How many are you going to have? !” I do my best to explain that we just go with the flow and let God decide! He must think we are doing something right to continue blessing us in this way! I can’t wait to follow along with your story! I started following you BECAUSE of your big family. It is an encouragement to see other families that have many kids. My husband and I feel very strongly about God calling us to a large family and 6 years into our marriage we are 3 weeks away from welcoming baby number 4. We will have 4 boys 4.5 years old and under and responses have been all over the place. 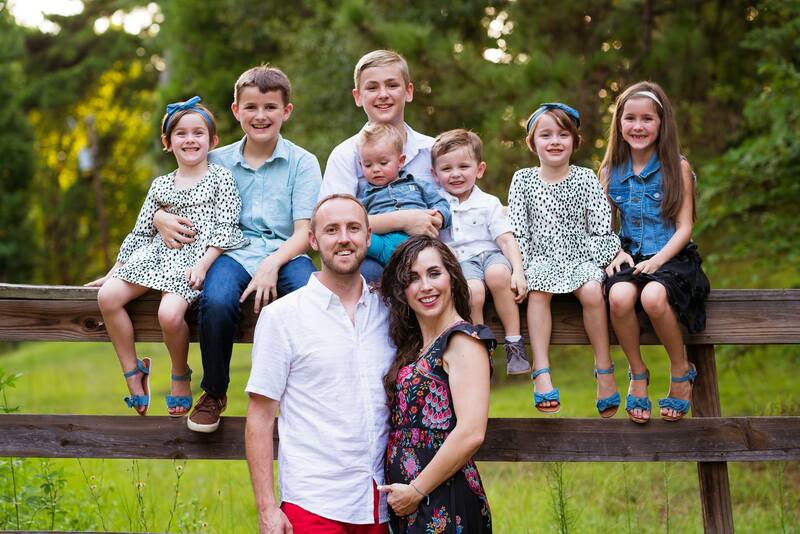 People feeling sorry for me having 4 boys, people thinking my husband is too demanding having this many kids so close together (20 months, 24 months, and 12 months), and people saying we are crazy for having 4 and not even being 30 yet ourselves. Luckily, my parents are so happy having all the grandkids and that is so helpful and encouraging for us. The only worry they have is that I have to have c-sections for every birth based on a number of medical issues. Four major surgeries in 4.5 years is hard on me, but if God calls me to grow a child I believe He will see me through the birth and recovery as well. And so far He has been so faithful. Keep having the precious babies! We plan to keep having babies until I can’t physically anymore, then we are moving onto foster care, another thing we have gotten some pretty negative reactions for. Thank you for being so open and real, but unapologetic in what God has called your family to. It is producing a beautiful result in both your family and in the lives you touch. Congratulations! I love your blog and your perspective on motherhood. I am 25 weeks with my second, my husband’s first. I am 38 years old and wish that he and I could have ALL the babies! We plan to have 2, only because of my age. I was a little worried announcing our pregnancy, because I am “advanced maternal age”. But we are so excited, and that excitement came through in our announcement. We have had mainly positive responses, but I’ve had the occasional, “Why do you want to start over? !” My son is 21 years old. I am so ready to “start over” and feel extremely blessed that the Lord has given us a precious baby girl. thank you for sharing what the Lord put on your heart about this specific topic! It’s evident that several of us need to hear these truths! Our baby #5 is due on January 23rd! I probably fell too much into the announcing with hesitation because *I* felt very surprised by this baby. Out last baby will be about 21 months old when this baby is born, which is closer than our others. But, I was surprised to discover that pretty much everyone in our life has responded very positively. And we are thrilled! Thank you for this encouraging post! Thanks for sharing this! We just announced our 6th pregnancy and clicking “share” caused a bit of anxiety. One friend commented “but why? You already have a baby.” (Our youngest is 14 months) She doesn’t have any children so I certainly don’t expect her to understand just how much joy children bring to a home. Congrats on baby #8! So exciting! I’m 34 weeks pregnant with our 3rd baby, due September 29! First 2 were boys and this time around it’s a girl(so we’ve gotten plenty of “so you can be done now” comments). I’m excited and nervous all at the same time! 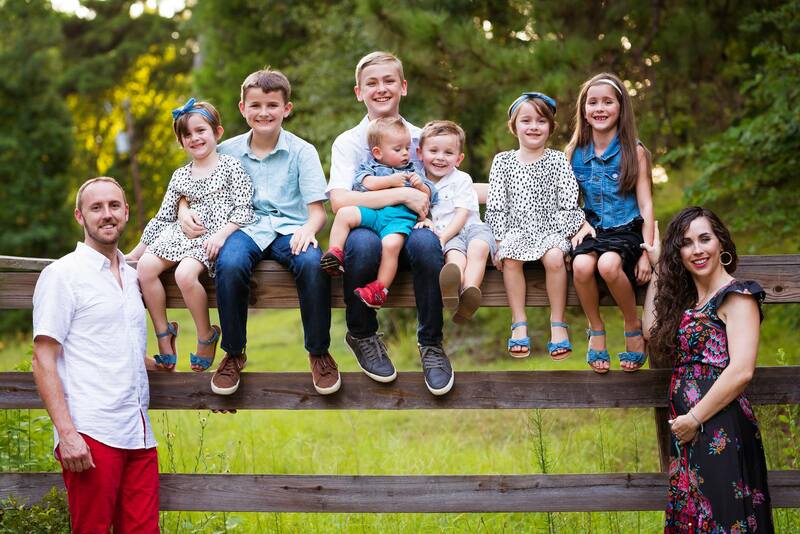 We’ve always said we want 4 or 5 kids, but the newborn stage is always the toughest part for me. I love your perspective and it’s been a big encouragement to me! I remember you saying before how you would pray and thank God for the blessing that each kid is in front of them, and I started doing that because I want our children to know they aren’t a burden but a huge blessing! Your timing is impeccable, and God has used you in my life so much recently. And you don’t even know me! We found out over the weekend that we’re expecting #3! I’m completely excited and (long story short) know completely that God had ordained this child to show of the work he is doing in my life and the community (church etc) around me. I KNOW this child is God given. Im rejoicing and praising God at the works I see him doing. But I still have this nagging fear. I have a 2.5 year old, and a 14 month old. I had only been married a aalittle over a month (married at 19) when we found out we were pregnant with my first, and she was 7 months old when we found out we were pregnant with my second. Both times i was young (19, 20) and afraid. My parents reacted out of worry and fear, and it didn’t help my raging hormones or anxiety that they thought I couldn’t do it. This time is different. I’ve matured amazingly in the past 3 years, ive grown closer to God, and I see His hand in all of this, even my past. But I’m afraid of their rejection and fear, because i know it will kick up my anxieties once again. I’ve had such peace, I’m afraid of anything stealing my joy. So this post has helped. I must secure my Outlook and respond only in the way I am truly feeling. We just had baby #7 last week – I have 7 kids ages 8 and under for another few weeks until my oldest turns 9. My first c-section which has been a bit rough but I am thankful for a beautiful little girl!! Hi Abbie, congratulations again! I am due with my third three days before you. I have found myself falling into an apologetic tone when telling people about this pregnancy, because my twins are only eleven months old and I am already four months pregnant again. I don’t think I was scared about receiving a negativ response, though, it was just a sort of default and that is disingenuous really because I do not regret this pregnancy at all. I do worry sometimes how I will cope with three under two, but that is a different matter. I look forward to reading more about your journey with baby number eight. Due with number 5 on 10/10 of this year. Thanks for this post! This is actually my 8th pregnancy we had three early losses so this isn’t my first rodeo by any means. I always feel guilty announcing since I’ve been down the infertility and loss road and I don’t want anyone else to be sad…. so I wait a while. However this time when we told family…. my parents were less than thrilled, even more so than when we told them about baby #4. I think they’ve come around but they also have backed away some/ have to have very controlled dates with only one maximum two of our kids. My father in law we have a limited relationship with and my mother in law passed about ten years ago, so it’s really only my parents as grandparents. It’s so hard and really really hurts. Thanks for this post it really encourages my heart. And a big congratulations!!!!!! This has been such an encouraging post to read! I was nervous to announce our pregnancy even though we were so excited because of fear of negative comments. I was worried of others thinking my husband and I are “too young” after receiving similar negativity by getting married when we were 21. Following your blog has been such an encouragement and blessing so thank you! (I am also 18 weeks but due the 23rd of January). I will never understand those who feel it necessary to interject their negativity into someone else’s happy news. While I am quite content with two children, I would never begrudge those who choose to have more children. I admire your courage and your energy, if anything. So, congratulations on number 8 and congratulations to anyone else out there that is scared to announce something exciting to them because it may be met with rude and nasty remarks from others! We are all living our own story and we should be proud of those stories!! Such a timely message as I’m dealing with this exact thing right now. Expecting #7…just ending the 2nd trimester and not a soul knows other than my husband and midwife because we always get negativity and It hurts my heart so much! I love my big family! Thank you so much for this encouragement! That was supposed to say entering the second trimester! Thank you for sharing your solid, balanced, big-God perspective. And huge congrats on #8!!! So so fun. Congrats on this precious life that is growing inside you! As for the “Mary’s” (those who share hurtful negative comments) in our lives they are speaking out of a place of something that is going on inside of them and saying things that shouldn’t be attached to the person they are speaking to even though their comment is in relation to the reciever. We can’t control what people say, we can only control what we believe, and like you said, what we say. Don’t let this kind of person take the streering wheel of our mind and life. One of my favorite positive pregnancy comments was when my neighbor and a mom, whom I never met before, walked across the street and opened with, “I’ve been admiring that beautiful belly of yours for weeks and thought it was time I came over and said, “Hi”". So I say the same to you, “I admire your beautiful belly and Hi!”. This is wonderful! I am one of fifteen kids and often when people find that out they respond negatively. Which is tough but I love the idea of responding in a positive light because I truly wouldn’t trade any of them for the world and I wouldn’t want it any other way. I’m an old mama!! But I’m a new-ish grandma, and I love the babies!! I had 3 boys, and I sincerely wish we’d had 2 more. Kids are so much fun, hard work, and challenging, all at once. Raising my family is the best thing I’ve ever done, and one I’m most proud of. Bless your family and your amazing children!! It’s 4:40 am and I’m awake nursing Baby #7 who arrived 12 hours ago!!! Congrats! Babies are fun. I’m due with #3 the end of next month .We’re excited!